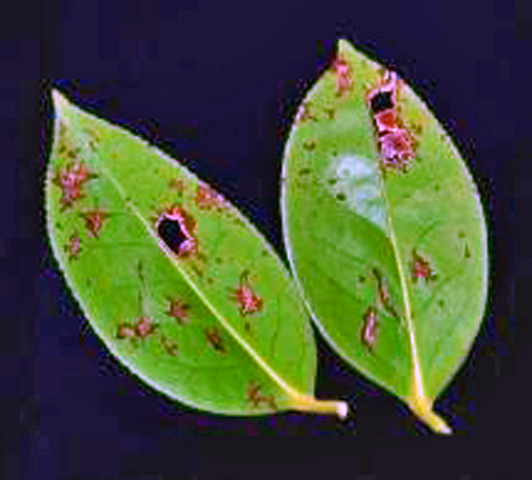 Camellia Oedema / Leaf gall is quite a common problem, and is thought to be caused by the roots taking up more water than the leaves can transpire, which results in localised water retention in the leaves. It is often more prominent in a cool, moist atmosphere. The symptoms: appear as tiny water soaked greenish-white spots (galls) that appear on the underside of the leaves or stems. Later these swellings becomes rust-colored with a corky texture, and eventually burst, leaving wart-like or corky patches. Water less frequently, improve air circulation and drainage around the plant/, consider re-potting containerised camellias. Removing affected leaves and spraying with a fungicide may help, but prevention is often the best cure, so reduce watering when planting out, and avoid overcrowding, this will reduce the humidity around the plant.